To find local licensed and insured bed bug exterminators in your area just fill in the form below. 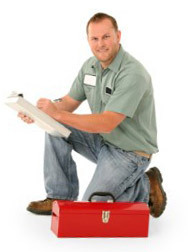 You will get a selection of local experienced pest control companies who can address your specific problem. Each will also provide an evaluation and price quote. To speak with a bed bugs expert in your area right now, call this toll free number 877-673-2704. Ask for bed bug related customer references. Those that don't have them should be crossed off your list. Ask for customer phone numbers and names. Ask if the company is a member of a national, state or local association of pest control experts. Confirm that the company is licensed in the State or Area you live. Confirm that the company has specific bed bug experience and ask them to describe their approach. For example some companies use freezing or heat to kill bed bugs (steam or forced hot air), others use bed bug dogs to sniff them out (a very effective approach for confirming an infestation). If they use a dog, be sure you are home to visually confirm the presence of bed bugs after the dog finds some. Only trust companies that insist on an inspection. Pricing should be based on the results of the inspection as not every bed bug problem is the same. For example, an infestation could be limited to one room, or be present in multiple rooms. Reject flat fee plans as you will either be over paying, or under treating your home. When you agree on a price get it in writing. Don't cut corners. This can be expensive, since treatment might take two people an entire day. Ask for a pre-treatment checklist so you can prepare the home or apartment. Ask if the treatment is guaranteed. It often takes 2 to 3 visits to be completely rid of a bed bug problem. The reason is that late hatching eggs are often missed, since they are so small and hard to spot. During the bed bug inspection, as the bedbug exterminator to point out hiding places. Work with the inspector to determine the best treatment approach, particularly in children's bed rooms or where there are pets. A professional will often charge up to $500 to inspect the home and make a positive identification that bed bugs are present. Costs are higher if a dog is used and lower if the exterminator can find and identify the insect on-site. Treatment costs vary based on the methods used and the size of the infestation. A good rule of thumb is $500 to $1000 per room. If an entire home is treated with heat, then estimates can go as high as $4,000. Insecticide or freezing type treatments will cost less. Even professionals may need to repeat any treatment 3 times to address any insects that were missed in the initial treatment. Heat treatment is effective the first time. Most consider bed bugs the hardest insect to treat. Each of these free brochures provides additional information on how to identify bed bugs in your home or apartment. Questions to ask before hiring a bed bug exterminator. Questions to ask and tips for hiring a bed bug company to exterminate an infestation.